In Ancient Egypt, royalty and rulership was a mandate of divinity. The pharaohs were reincarnated forms of the great sun god and ready to bring their people to an epic future of wealth untold under the guardianship of their priests who spoke with the great gods. Those who were disturbed or ruled unwisely might rise as mummies, forever tormented to wander the sands until the rightful pharaoh might come and return them to their slumber. But, the best thing about the pharaohs were that we had no specific limitations on who might be named! Those with the divine right would be raised, no matter who they were. The great queen Nefertiti ruled as the great female Pharaoh long before anyone contemplated if a woman could some day be president or chancellor! And, it wasn’t limited to just that. The great King Tutankhamen, the boy king, became one of the most famously known names in even our modern era. Even children could possess the wisdom to rule… at least for a while. And, reincarnation is still a thing, even these many years later. 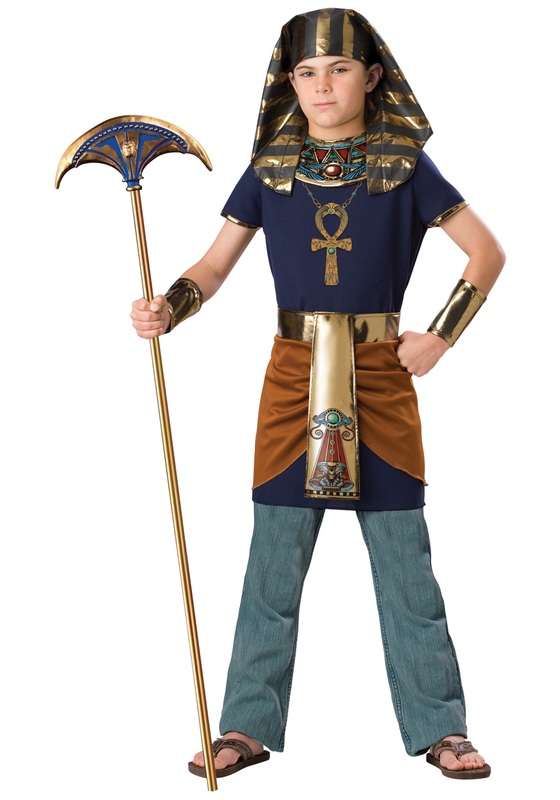 Channel the lost soul of King Tut by gifting your kiddo with the luxury of rule with this Child Pharaoh costume. The navy blue tunic has a printed ankh necklace and is edged in gold to both ensure a regal look while providing protection against dangerous forces. The brown interlock gathered loincloth is sewn to a sash and fastened with Velcro to stay in place, also featuring gold knit and mysterious Egyptian printed designs. The iconic headdress of the Pharaoh fastens with Velcro and falls over the shoulders like a regal crown. And, just in case you’re worried that your tyke might let the power get out of hand, the Pharaoh costume comes in multiple sizes so you can all rule as a dynastic family! This is a nice costume, but a little expensive for the materials used. The "necklace" is just printed on and the gold on some parts of the headpiece was rubbed off. My son loved it for his school performance, though. Definitely order at least one size up. A size 12 was loose on my average-sized 8 year-old son, but he doesn't like tight clothes. There is no way a size 8 would have fit him. Nice costume. However, it runs a bit small so, would recommend ordering a larger size.